Richard Diebenkorn (1922–1993) was a twentieth-century American painter and printmaker and an important member of both the Abstract Expressionist movement—specifically in California in the 1950s—and The Bay Area Figurative movement. Throughout his Abstract Expressionist years, Diebenkorn drew inspiration from a number of important artists including Willem de Kooning, Clyfford Still, and Mark Rothko. Yet his approach was highly original, often incorporating the unique layering of colors he experienced throughout his travels. Moving away from Abstract Expressionism, Diebenkorn established himself as an important member of the Bay Area Figurative Movement in California in the late 1960s and early ‘70s. This group of artists returned to a more traditional and figurative style of representation. 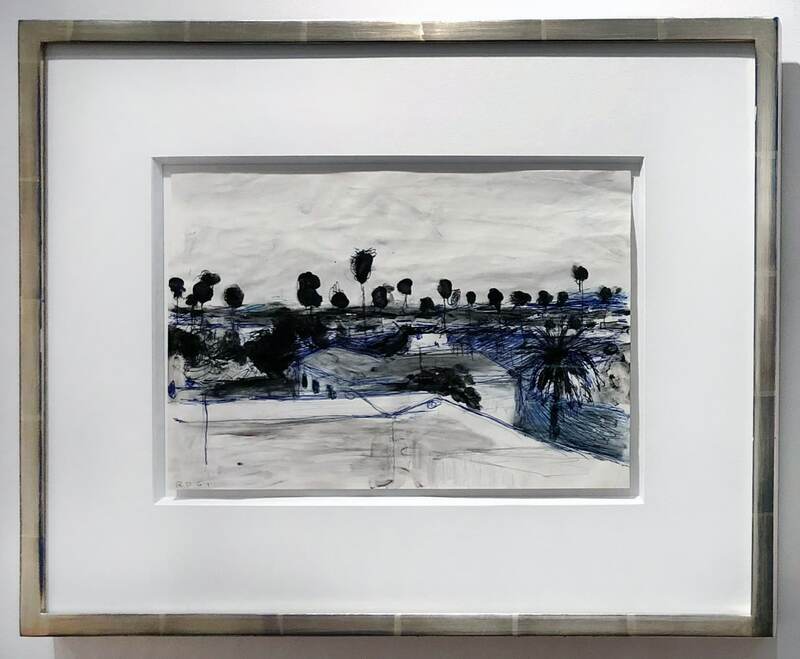 It was during this time that Diebenkorn struck an extraordinary balance between his Abstract Expressionist and figurative styles in an open-ended series of paintings based on aerial landscapes called The Ocean Park Series. These pivotal works represent Diebenkorn’s synthesizing style, which has received worldwide acclaim. Richard Clifford Diebenkorn, Jr. was born in April, 1922 in Portland, Oregon. When he was two years old, his father, who was a hotel supply sales executive, relocated the family to San Francisco. Diebenkorn attended Lowell High School from 1937–40, and entered Stanford University in 1940. There he concentrated in studio art and art history, studying under Victor Arnautoff and Daniel Mendelowitz. The latter encouraged his interest in such American artists as Arthur Dove, Charles Sheeler and, most seminally, Edward Hopper. Mendelowitz also took his promising student to visit the home of Sarah Stein, sister-in-law of Gertrude Stein, where he saw works by Paul Cézanne, Pablo Picasso and Henri Matisse; this early exposure to European modernism opened doors that continued to beckon in the future. In June, 1943, Diebenkorn married fellow Stanford student Phyllis Gilman; they would have two children, Gretchen (born 1945) and Christopher (born 1947). Diebenkorn served in the U.S. Marine Corps from 1943 until 1945. While stationed in Quantico, Virginia, he visited a number of important collections of modern art, including the Museum of Modern Art in New York, the Gallatin Collection at the Philadelphia Museum of Art, and, most often, the Phillips Collection in Washington, DC. He internalized influences from Cézanne, Julio González, Paul Klee, Joan Miró, Mark Rothko and Kurt Schwitters; certain key paintings, such as Matisse’s 1916 Studio, Quai St. Michel at the Phillips Collection were especially compelling for him. During this time he experimented with abstract watercolor as well as making the representational sketches that would continue when he was stationed in Hawaii, and these constitute his ”wartime” work. Returning from military duty to San Francisco, in 1946 Diebenkorn took advantage of the G.I. bill to study at the California School of Fine Arts, where he met many serious contemporaries who would remain friends and artistic colleagues, and a slightly older one, David Park, who would have an especially important influence on him. In the fall of 1946, he received the Albert Bender Grant-in-Aid fellowship, allowing him to spend nearly a year in Woodstock, New York, in an environment where serious abstract artists (among them the sculptor Raoul Hague and the painter Melville Price) were finding their experimental ways. In New York City, he had his first contact with William Baziotes and Bradley Walker Tomlin. Diebenkorn’s relatively small canvases of this period reflect these sources, many of whom were greatly influenced by Picasso. Diebenkorn and his wife, Phyllis, returned to San Francisco in 1947; they settled in Sausalito, and the artist became a faculty member at the California School of Fine Arts. Fellow teachers there included Clyfford Still, Elmer Bischoff, Hassel Smith, Edward Corbett and David Park. His first one-person exhibition was held at the California Palace of the Legion of Honor in 1948, a singular distinction for so young a painter. In 1949, he was awarded his B.A. degree from Stanford. It was during this period—1947 to late 1949—that his first “period”—the Sausalito Period—took shape. In 1950 Diebenkorn enrolled at the University of New Mexico, Albuquerque, wanting to take advantage of the G.I. Bill benefits still available to him, and to try out a new environment for his visual imagination. He and his family remained in Albuquerque for two and a half years; halfway through his tenure there, he presented a cycle of paintings as his master’s degree exhibition. The “Albuquerque Period” represents the first mature statement of Richard Diebenkorn’s distinctive, and powerful, presence on the American avant-garde art scene. During the Albuquerque years, Diebenkorn visited and was greatly impacted by a retrospective exhibition of Arshile Gorky at the San Francisco Museum of Art. This and an epiphanic experience viewing the landscape from the perspective of a rather low-flying plane, shaped his own work in the ensuing months. He combined landscape influence, aerial perspective, and a private, calligraphic language, into an artistic style that flowered in myriad directions, and whose ideas ramified in virtually all of his work in subsequent periods. At this time, he established his life-long pattern of working simultaneously in large-scale oil paintings, and ambitious, if often restlessly experimental, works on paper. 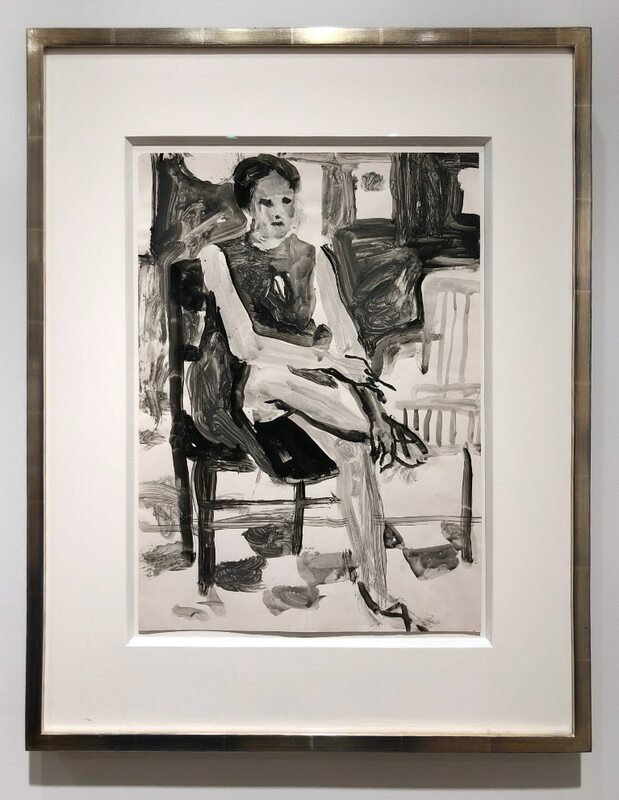 Diebenkorn’s first in-depth exposure to the work of Henri Matisse happened in the summer of 1952, when he saw the retrospective exhibition organized by Alfred Barr for the Museum of Modern Art, New York, in its venue at the Municipal Art Gallery in Los Angeles. In the fall of that year, he moved with his family to Urbana, Illinois, having accepted a teaching position at the University of Illinois. The work made at that time is known as the “Urbana Period”; it is characterized by a continuation of his subtle abstract/calligraphic style, but with a richer, more intense palette. In the summer of 1953, he visited New York, where, among many other artists, he first met Franz Kline. In September, he returned with his family to Berkeley, settling there for a number of years. The paintings and drawings of the “Berkeley Period” established the artist as an abstract painter of uncommon authority and bravura. In the fall of 1953, Diebenkorn received an Abraham Rosenberg Traveling Fellowship for advanced study in art, and was able to work in his studio on a full-time basis. In late 1955, Diebenkorn suddenly launched upon a path that veered dramatically from his extended early abstract period: he began to work in a “representational” mode, painting and drawing landscapes, figure studies and still lifes. With fellow artists David Park, Elmer Bischoff and later Frank Lobdell, he regularly worked on figure drawing from models; one of his largest bodies of work comprises exhaustively experimental figure drawings. He was also prolific in the still life genre: some of his nearly monochromatic still life drawings are among the most distinctive, and ravishing, in twentieth century art. But it was the figurative and landscape paintings of this period (1956–67) that created an ever increasing audience for his work. In March, 1956, he had the first of nine exhibitions at the Poindexter Gallery in New York; these were duly noted by the East Coast art establishment and helped further his national reputation. In the academic year 1963–64, the artist left his teaching activity at the San Francisco Art Institute (formerly the California School of Fine Arts) and accepted an artist-in-residence stint at Stanford University. This period produced an especially concentrated and lyrical group of figure drawings, in addition to paintings. In 1964 he was invited to visit the Soviet Union on a Cultural Exchange Grant from the U.S. State Department. On that (somewhat harrowing) trip, he was able to see the great Matisse paintings at the Hermitage in Leningrad and the Pushkin Museum in Moscow, which had been unavailable to most of the world for decades. This experience fed his work of the next period. In 1965, he began the late figurative works, characterized by relatively flat, planar areas of color, geometric compositions, and occasionally smaller areas of decorative figuration. In 1966, he saw the Matisse retrospective at the University of California, Los Angeles Art Gallery which included View of Notre Dame and Open Window, Collioure. It was in 1966, too, that he and Phyllis moved from Berkeley to Santa Monica, where Diebenkorn accepted a teaching position at UCLA. Within several months of beginning work in his first Santa Monica studio, located in a neighborhood near the beach known as Ocean Park, the artist embarked on the great cycle of paintings and drawings known as the Ocean Park works. In doing so, he definitively ended his figurative approach, to invent a unique abstract language he would develop until 1988. In 1971, he had his first exhibition at the Marlborough Gallery in New York; these three shows became much-anticipated opportunities to observe the unfolding of the Ocean Park vocabulary. In 1977, he moved to New York’s M. Knoedler & Co., Inc, where, over the course of the next decade—working with gallery director Larry Rubin—he exhibited nearly annually. This would become a series of events perhaps even more appreciated than his earlier Ocean Park shows at Marlborough. Both the drawings and paintings became ever more richly chromatic and compositionally complex. In 1976–77, the Albright-Knox Art Gallery in Buffalo, New York, organized a major retrospective exhibition which traveled to Washington, DC, New York City, Cincinnati, Los Angeles and Oakland. By now Diebenkorn was generally regarded as a well-established American master; his association with California would always remain, but his stature as a world-class modern artist was secure. 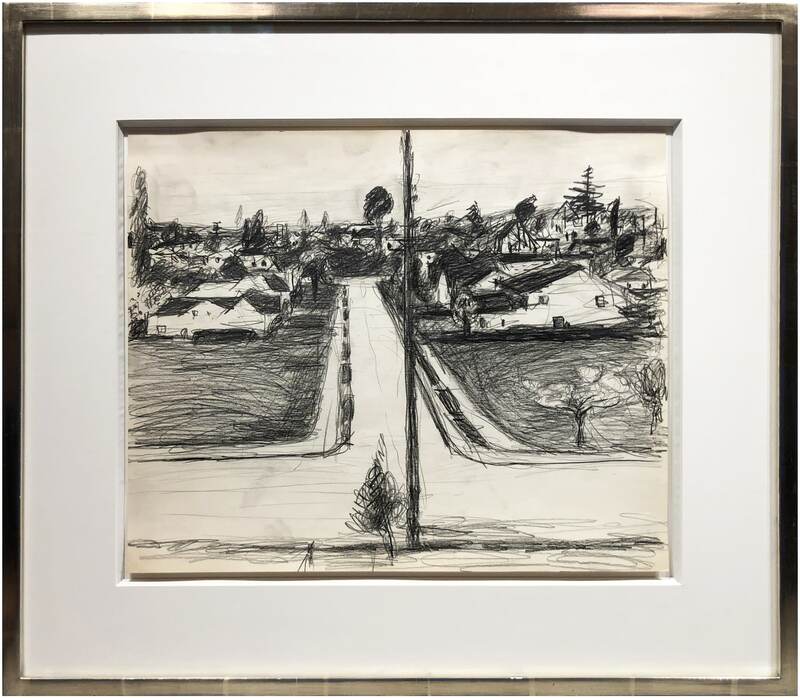 In late 1988, and continuing as a traveling exhibition throughout 1989, Diebenkorn’s works on paper were organized into a major show and book by the Museum of Modern Art’s curator John Elderfield. This was a landmark event for the artist and his public, including, as it did, the entire range of his stylistic journey right through the late 1980s. In the spring of 1988, Richard and Phyllis Diebenkorn moved from Santa Monica to Healdsburg, California, to a rural home near the Russian River, overlooking vineyards and scrub-oak hillsides. In his Healdsburg studio he worked in mostly small scale, producing some of the most gem-like, quirkily decorative, and perfectly executed, works of his life. Though he experienced serious health problems during much of his time in Healdsburg, he was able to continue his restless exploration of form and color and poetic metaphor. Virtually all of the Healdsburg work was abstract. However, in one of his last ambitious print series, done in 1990, he represented variations on the theme of a coat on a hanger. The late etchings, meant to illustrate a luxury edition book of poems by W.B. Yeats published by San Francisco’s Arion Press, constitute a kind of valedictory gesture. In late 1992, the Diebenkorns were forced to take up residence at their Berkeley apartment in order to be nearer to medical treatment. They looked forward to returning to Healdsburg, but were never able to do so. Richard Diebenkorn died there on March 30, 1993. 2011 – “Richard Diebenkorn: The Ocean Park Series,” The Modern Art Museum of Fort Worth, Texas; Traveled to: the Orange County Museum of Art, Newport Beach; Corcoran Gallery of Art, Washington, D.C.